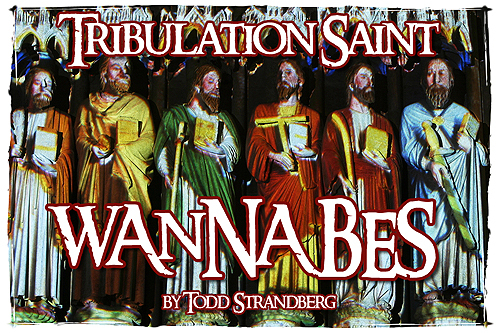 You folks probably have no idea how many times a day I receive e-mail messages from tribulation saint wannabes who write to encourage me to rethink my belief in the pre-trib rapture. Because Rapture Ready is now one of the leading sites on the subject of the rapture, I'm constantly receiving messages that challenge my pre-trib view. Many of these people rant about how I'm setting all my readers up for the big Antichrist deception. I'm constantly being told that the pretribulation rapture doctrine is the "great apostasy" and that anyone preaching this view is an agent of the devil. Most of these people are so much in love with the idea of a post-trib rapture that they don't even bother to validate their view with Scripture. I would estimate that 90 percent of the people who write me never quote a single verse from the Bible. For the sake of the argument, granting the possibility that the rapture transpires at a later time, there's no logical reason for a Bible-believing Christian to be tricked into following the Antichrist. It's normally the post-trib folks who are the most vocal about their predictions of mass defections from the faith. I think telling the difference between the Antichrist and Jesus Christ will be as easy as telling the difference between a $5 watch sold at Wal-Mart and a $5,000 watch made by Rolex. Because the Bible teaches we will be raptured to meet the Lord Jesus in the air, no man on earth could possibly qualify as the Messiah. I would simply say, if you haven't been raptured yet, keep waiting for the real Savior. "For the Lord himself shall descend from heaven with a shout, with the voice of the archangel, and with the trump of God: and the dead in Christ shall rise first: Then we which are alive and remain shall be caught up together with them in the clouds, to meet the Lord in the air: and so shall we ever be with the Lord" (1 Th 4:16-17). Because Revelation proclaims Jesus will return with great power and majesty, it's pure folly to follow after a political leader that appears on the scene via a humble stage door. "And the heaven departed as a scroll when it is rolled together; and every mountain and island were moved out of their places. And the kings of the earth, and the great men, and the rich men, and the chief captains, and the mighty men, and every bondman, and every free man, hid themselves in the dens and in the rocks of the mountains; And said to the mountains and rocks, Fall on us, and hide us from the face of him that sitteth on the throne, and from the wrath of the Lamb" (Rev 6:14-6). The most disturbing error I find with the pro-tribulation crowd is the belief that Christians are promised special protection from the tribulation horrors. Some people try to use pre-trib Scriptures like Revelation 3:10 to claim God will protect Christians, but most use their own logic to conclude God's grace will allow us to stay perfectly safe those seven long years. "And it was given unto him to make war with the saints, and to overcome them: and power was given him over all kindreds, and tongues, and nations" (Rev 13:7). "And he had power to give life unto the image of the beast, that the image of the beast should both speak, and cause that as many as would not worship the image of the beast should be killed" (Rev 13:15). "Here is the patience of the saints: here are they that keep the commandments of God, and the faith of Jesus. And I heard a voice from heaven saying unto me, Write, Blessed are the dead which die in the Lord from henceforth: Yea, saith the Spirit, that they may rest from their labors; and their works do follow them" (Rev 14:12-13). "And I saw thrones, and they sat upon them, and judgment was given unto them: and I saw the souls of them that were beheaded for the witness of Jesus, and for the word of God, and which had not worshipped the beast, neither his image, neither had received his mark upon their foreheads, or in their hands; and they lived and reigned with Christ a thousand years" (Rev 20:4). Jesus made His own prediction about how bad the global persecution of believers will be during the tribulation. He added an ominous warning that some people will betray one another. "Then shall they deliver you up to be afflicted, and shall kill you: and ye shall be hated of all nations for my name's sake. And then shall many be offended, and shall betray one another, and shall hate one another" (Mat 24:9-10). "For in those days shall be affliction, such as was not from the beginning of the creation which God created unto this time, neither shall be" (Mark 13:19). During the tribulation period, the Jews will suffer horrendous persecution. The prophet Zechariah predicted that two-thirds of the Jewish people will perish. If 66% of Israel is wiped out, where does that leave the poor Gentile Christians? "And it shall come to pass, that in all the land, saith the LORD, two parts therein shall be cut off and die; but the third shall be left therein. And I will bring the third part through the fire, and will refine them as silver is refined, and will try them as gold is tried: they shall call on my name, and I will hear them: I will say, It is my people: and they shall say, The LORD is my God" (Zec 13:8-9). I've read tens of thousands of messages over the years and I've searched through numerous post-trib and pre-wrath web sites, and I can only recall finding maybe one or two people who realized they would likely be martyred for their faith. The majority of these folks have the bizarre, joyous view of the coming tribulation that simply makes a mockery of the Bible's dire warnings. They also seem to think they're going to be able to walk up to the Antichrist, poke him in the nose, and say, "OK buster, I've got you all figured out." Clearly, we have an overabundance of the type of bravery Peter and the other disciples briefly displayed in the Garden of Gethsemane before they all betrayed Jesus. The Roman soldiers displayed no desire to apprehend Jesus� disciples, but when the soldiers slapped the cuffs on Jesus, the disciples ran like the devil was chasing them. Without a doubt, people who generally make the boldest statements are often also the first to run. Because they've never fully counted the cost, they're able to make valiant declarations to which they could never live up. I would be a liar if I said I could boldly and easily make a life-and-death decision. Unlike these people who feign bravery, I have considered what it would take to lay down my life for the cause of Christ. I think it would take many hours of prayer to reach the point at which I would be able to face starvation or an executioner's ax. Jesus prayed many times for an alternative to the cross, but when He realized there was no other way, He chose to follow God's perfect will.